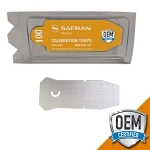 Sample, verification and calibration swabs (also known as traps) are an essential consumable item for the Itemiser explosive trace detection machine. Each swab serves a different purpose and must be used at specified intervals during the operation of the equipment. Sample swabs are designed to collect fine amounts of illicit substances for analysis by the trace detectors. Calibration and verification swabs introduce reference points to the device for substance detection and accounts for variations in temperature, pressure, and humidity. The Itemiser ETD machine must go through calibration and verification for accurate explosive detection. Itemiser swabs are made of Teflon coated fiberglass that are designed to handle the high heats required to collect samples from the traps. Sample traps hold up well to water, heat and use but must be replaced if they are torn or have been contaminated in the collection process. All OEM Itemiser traps are packaged in plastic clamshell containers that are designed for easy access and to reseal tightly to preserve unused swabs. Sample and calibration swabs should be used within 12 months of purchase while verification traps should be used within 6 months for accurate results. 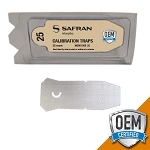 Sample, verification and calibration traps are available in 25 count packages, ideal for smaller checkpoints, or 100 count packages, ideal for larger screening operations. Additionally, each type of swab is stamped with a unique symbol for easy identification. Itemiser sample swabs are used to collect trace chemicals from shoes, cell phones, hands, bags and just about anywhere else remnants of chemicals can be retrieved. The sample traps (hand swabs) are inserted into the explosive trace detection machine where the chemical traces are analyzed and displayed on the screen. Itemiser explosive detection devices work by burning off trace elements of explosive and narcotic materials to turn them into gas as they move down the ITMS detection path. The machine then analyzes the time it takes the gas reach the detector and depending on the travel time of the gas, the explosive trace detection machine may alert to a potential threat. Any alarm should be resolved in accordance with your organization’s current operating procedures. Itemiser DX ETD machines are used by thousands of TSA, Certified Cargo Screening Programs (CCSP), cargo security companies, law enforcement and critical infrastructure facilities around the world.